This is an extremely difficult problem and may take up days of your time to figure out. 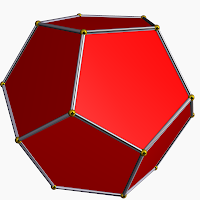 A regular dodecahedron has twelve pentagonal sides and twenty vertices. Assuming that one face is in the X-Y plane with an edge along (0,0,0) to (0,1,0), what are the coordinates of the remaining 18 vertices? The correct answers are posted only after several comments have been made. This allows readers to try to solve the puzzle on their own before being given the solution. If you need the solution right away you can leave a comment requesting the solution and one will be made availiable.